If you’ve already seen the beauties of the Golden Circle, I highly recommend checking the weather forecast and taking a trip to the South Coast of Iceland! I was fortunate that my friends drove me and we couldn’t have chosen a better day! But you can also take a tour bus or smaller private tour. If driving yourself, I suggest taking the 2 hour drive from Reykjavik all the way to Vik – starting at the far end and working your way back towards Reykjavik – this way you’ll avoid the main bulk of the tourist buses who usually do things in the opposite order. 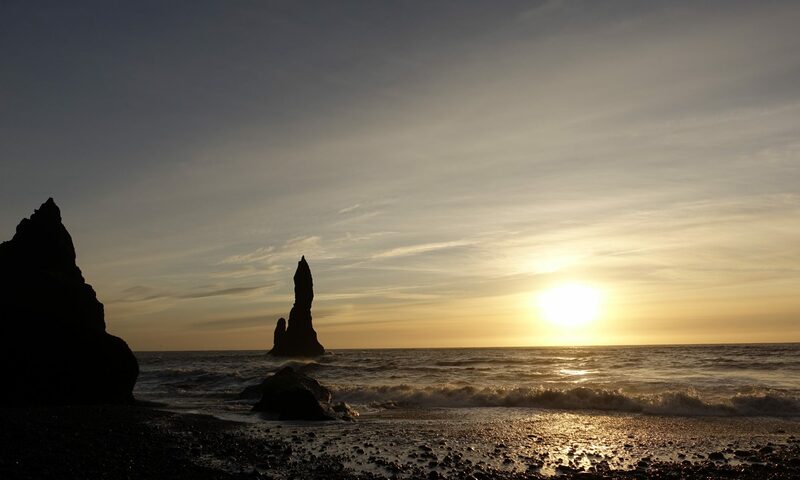 Along the way you’ll see the black sand beach Reynisfjara and the incredible basalt rock formations of Reynisdrangar – well worth a walk around and a climb on if it’s dry and safe to do so. Obviously, be very careful with the sea, there are big warnings by the car park as a lot of tourists underestimate just how dangerous it can be and easy to be pulled under the waves – don’t be an idiot. You can also chose to visit the D3 US Navy plane wreckage – but if you’re visiting in winter and daylight is very limited, take into account it’s a 45 minute walk EACH WAY from the car park to the beach with the plane wreck on and there will probably be a bunch of tourists clambering all over it taking selfies – could be worth seeing in the longer summer days, but we skipped this in the middle of winter as we only had a few hours of sunshine to take advantage of! Skogafoss – the huge waterfall is beautiful and mighty – the stones by the river at the bottom can get very icy and slippery as the waterfall is caused by melting glacier ice after all. There’s a path and stairs up to the right, if you’re able bodied and have grippy footwear, the stop part way up offers a great view of the waterfall, but could be dangerous if you’re not fit and wearing decent footwear – in my opinion a much better view with nobody else there in comparison with the viewing point from the top where everybody walks to. Seljalandsfoss – another huge waterfall… which you can walk behind! This is pretty impressive and perhaps even a bit romantic – again, just be careful with how slippery the paths and rocks can get from the spray and ice that forms from the waterfall. A lot of people also miss the nearby, hidden waterfall – Gljurfrabui – From Seljalandsfoss, continue walking along the path, past the smaller waterfall towards a cream coloured farm house with a red roof – behind there you will come a river at the end of the path. If you have waterproof footwear, you can walk along the stones over the water in between the gorge in the rocks to find the most beautiful secret waterfall that most tourist groups miss. Depending on how much water flow there is, the spray can be pretty intense, definitely one that requires waterproofs, however it is well worth it! But shhhhhh… don’t tell everyone, it’s a secret!! !